Spray Paint Thrift Store Dishes - Sincerely, Sara D.
I LOVE white dishes. I love their simplicity and how they brighten up any space. I found my dishes at a local Goodwill. Look past the color and design and focus on the shape of the pieces. I used glossy white Rust-Oleum spray paint and sprayed the pieces with three coats of paint. It is important to do several light coats verses one heavy coat (let each coat dry before applying the next). It WILL drip if you’re not careful! 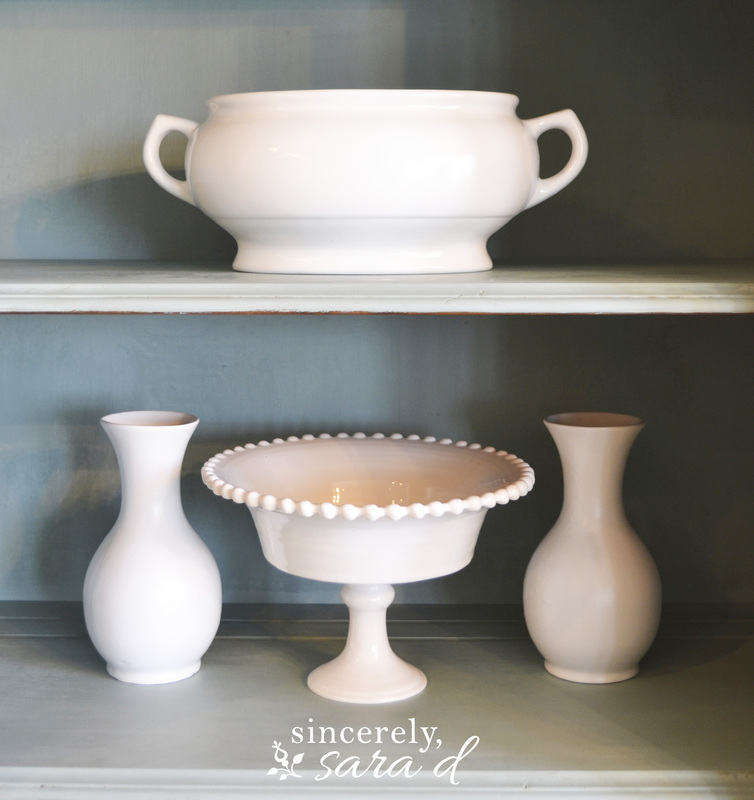 I now have a hutch full of pretty white dishes for next to nothing. 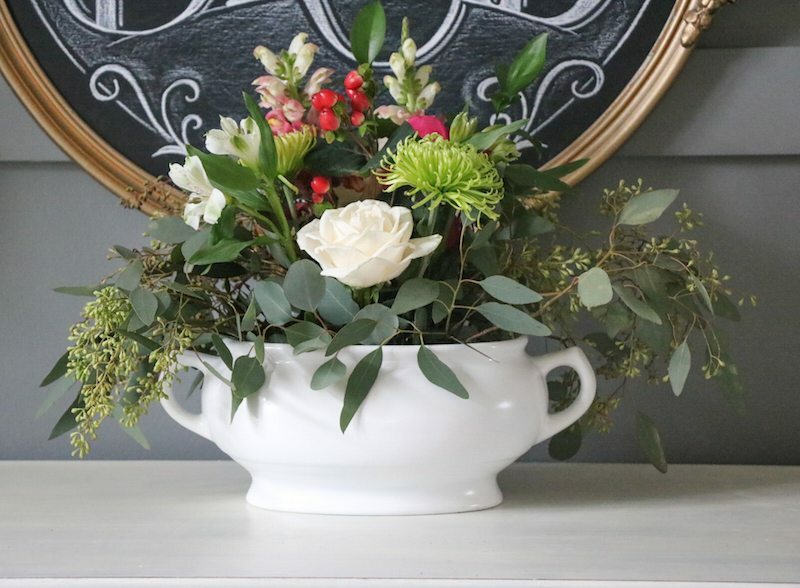 I love using the vases for floral arrangements. 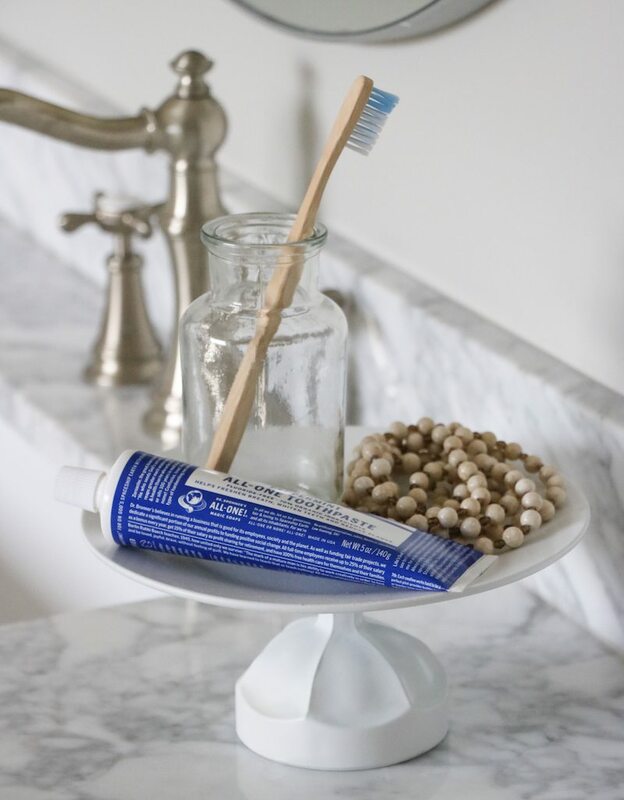 If you want to take this DIY to the next level and get a little more creative, you can glue dishes together. I have made several pedestal stands for decor pieces. 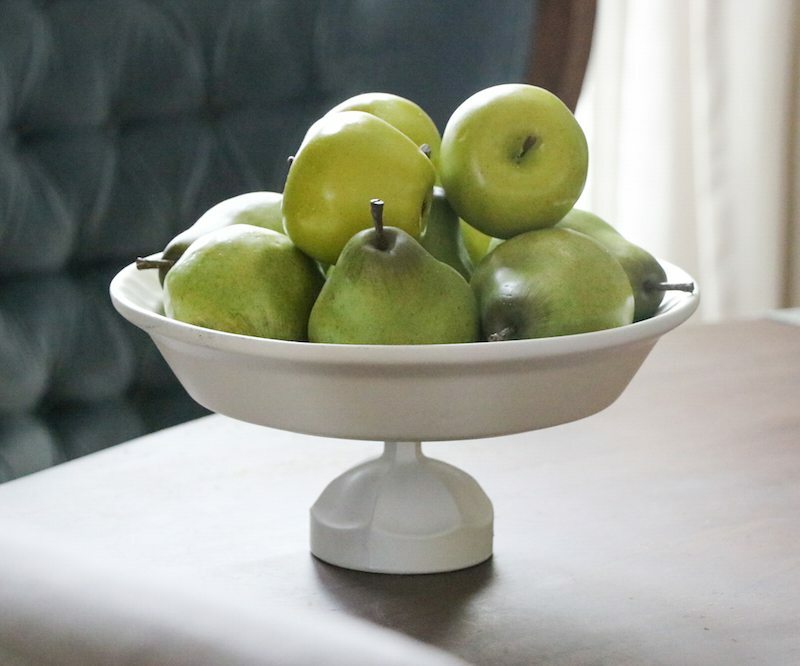 All you need is a plate and a candlestick holder (ice-cream dishes can also work). 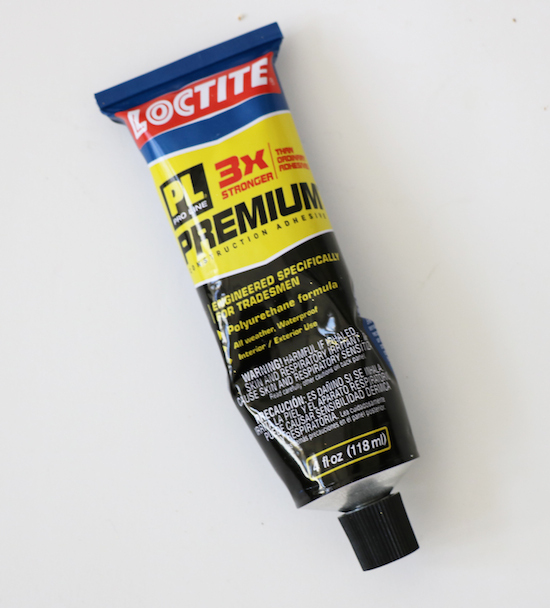 Glue the pieces together using a strong ceramic adhesive and allow it to completely dry according to the manufacturer’s instructions. Once the glue is dry, spray paint the entire piece (keeping in mind less is more – several thin coats of paint is best). 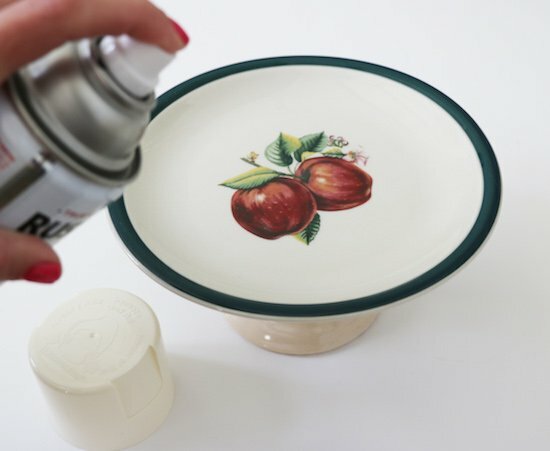 These DIY spray painted dishes are perfect for home decor accent pieces. 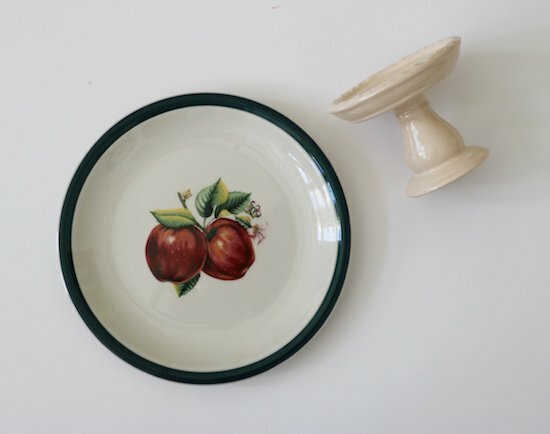 These apples are not real – you do not want to use these spray painted dishes for food. 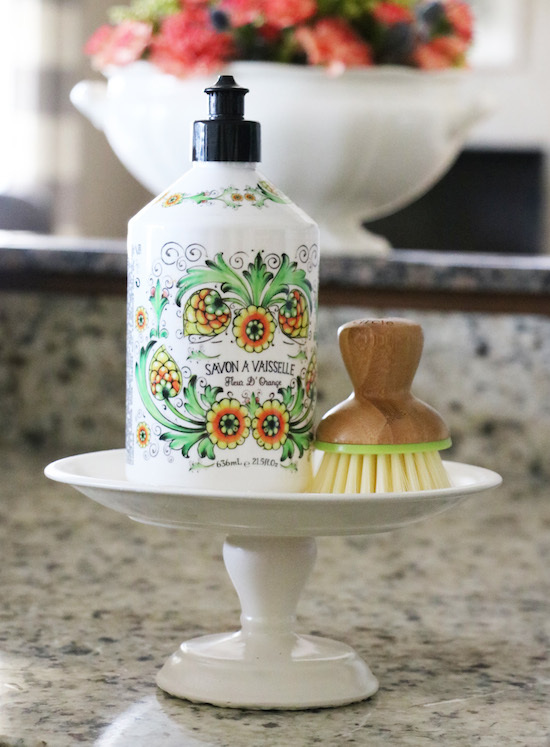 I use these little pedestal stands all over my home. 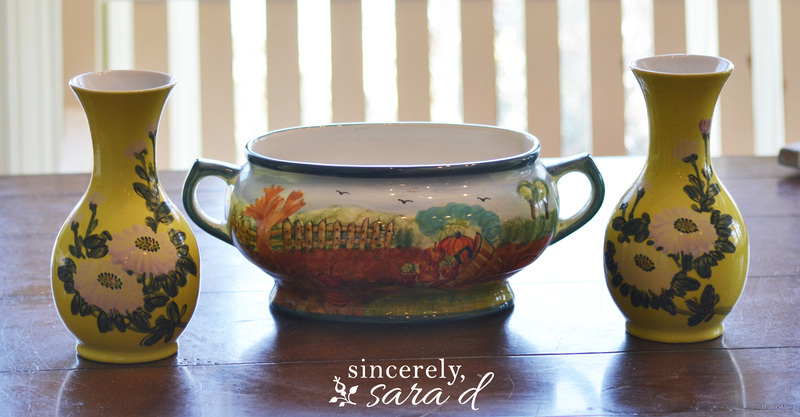 Now, I may not be able to “use” my dishes (again, these are for DECOR purpose only), but they sure do dress up my home! 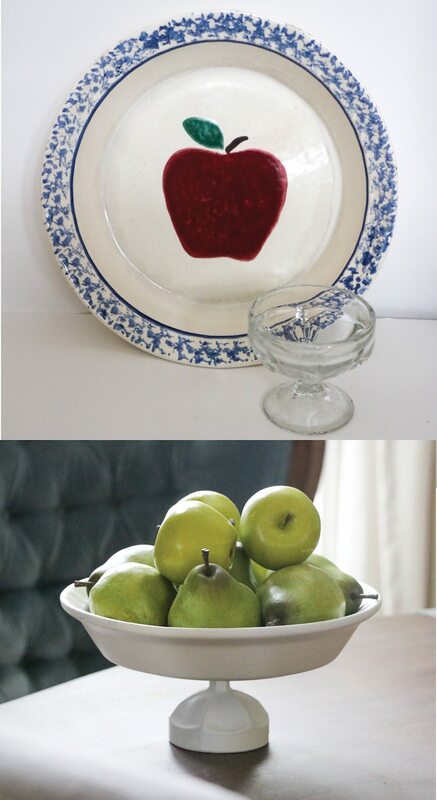 *Although I don’t recommend using spray painted dishes with food, all paint sold in the US in non-toxic once dry! Looks gorgeous! I need to try this paint my attempts always involve drips 😉 great post! After spraying are you able to use them with food. Do you need to bake it? Linda – unfortunately these are not food safe. I painted these for decor purposes only. Sue, thanks for the kind words and for stopping by! …and it always feels okay to spend money at them. What a great idea! 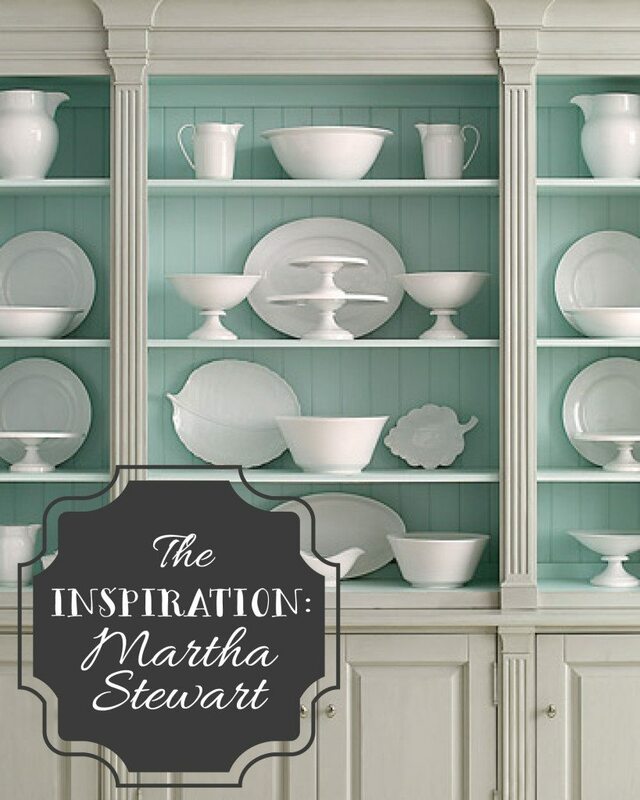 I love that Martha photo too and am also obsessed with white dishes displayed. I’m a spray paint junkie too. When spray painting what type of covering do you use underneath your object to be painted ? Do you turn your object upside down to paint it ? Hi Violet’s Cottage! In this case (with the old dishes), I did not use a primer. I bought the “paint and primer in one” spray paint, and it really has held up well. I flip my objects with each coat. Light coats are the trick – and I typically start with the object right side up. Once in dries, I flip it upside down and give it another (light) coat. I just repeat this process until the object has a nice paint coat. Thanks for the comment! Thanks so much, Jo Ann! You’re right, Dave! That would definitely be a tragedy! Painting is a great thing when it’s used on (worthless) pieces that would otherwise be thrown to the curb. It’s always good to do your research before you pull out the paint! Thanks for you comment. Love this idea. 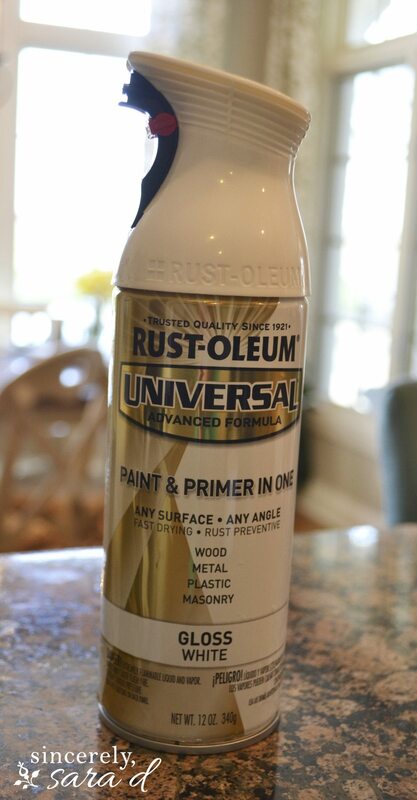 I’ve tried other spray paints and the paint chipped so I will definitely buy the Rustoleum brand. I love white dishes too. Yours look fantastic!! Good spray paint really makes all the difference. Good luck Wendy and thanks for the comment! Great post! Although I noticed you wouldn’t be able to serve food in it. Do you think it would be safe if just the outside is repainted? I found a white gravy dish with hideous printing on the side that I just want to cover up so the whole thing is white. Thanks, and LOVE your site! Hi Samantha! I hate to tell you yes if there is something toxic in the paint, but I can tell you that you can buy ceramic paint. I haven’t tried any yet, but it’s completely safe for eating. You do have to bake the piece in your oven (just like you would in a kiln) to set the paint. Good luck and thanks for the comment! This frightens me because I buy a lot of dishes at thrift stores for everyday use. How can I tell if one is painted like yours and not food safe. Hi Joyce. I really don’t think you need to worry about this. I’m guessing very few people paint their dishes like I did. But if a dish was spray painted, it would be fairly easy to tell that it was done. It’s almost impossible not to have a few drips here and there. So, no worries! lovely idea. I stumbled across a lovely teapot on a flea market and will spray paint it to give to my Mum for her birthday. What do you figure, if I close off the spout and lid area, so only spray paint the outside that it can still be used (as in used to make tea every 2 years, knowing my Mum)? I would love to be able to tell you yes, but I’m afraid to since spray paint is toxic. I recently spray painted the outside of the lids to my canisters, but the paint will never be heated liked your teapot. There is ceramic paint, and I definitely think your Mum’s teapot would benefit greatly from this type of paint! You paint it and then set it using an oven to heat it. Good luck, and I hope I helped! Just be careful what you’re painting, as expensive collectables sometimes end up at the thrift store or yard sale by sellers who don’t know better. Esp. do a little homework on signed/numbered pieces. Barb – you’re exactly right! I should stress the importance of painting over worthless dishes. The last thing I’d want to see is ruined collectables. I really do think they would be fine for water and flowers. Spray paint is oil based, so it should hold up well to a situation like this. 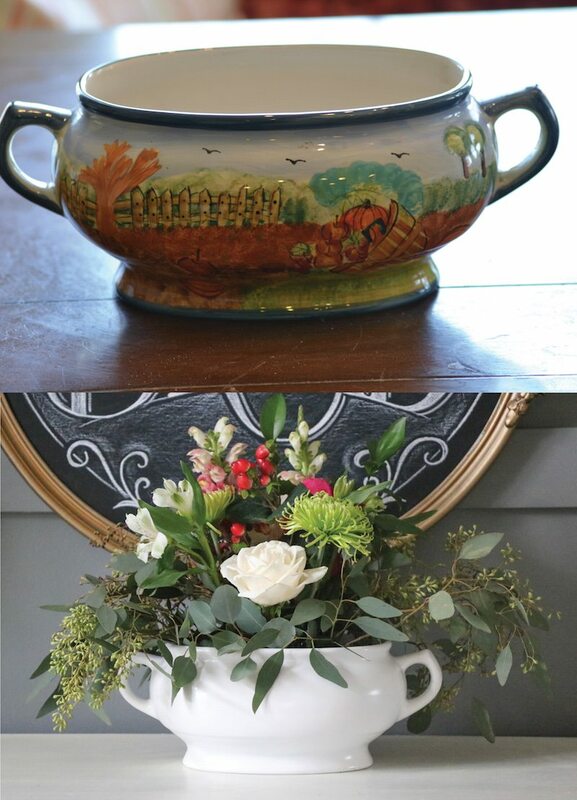 Also, you just need to paint the outside of the vases. Good luck!! Beautifully done. 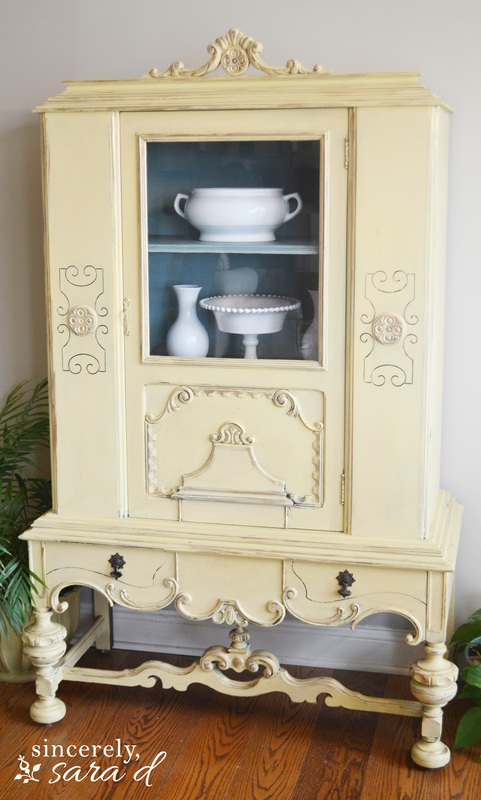 Love the yellow cabinet as well. Martha Stewart … eat your heart out! I just happened upon your blog and had to laugh when I read your bio. I too love to paint and there is nothing I won’t try. Everyone knows this about me. In fact, my husband often says that the only reason he hasn’t been painted is because he keeps moving! My latest project was a fabric tub chair. It needed a lift and upolstering it was out of my budget. 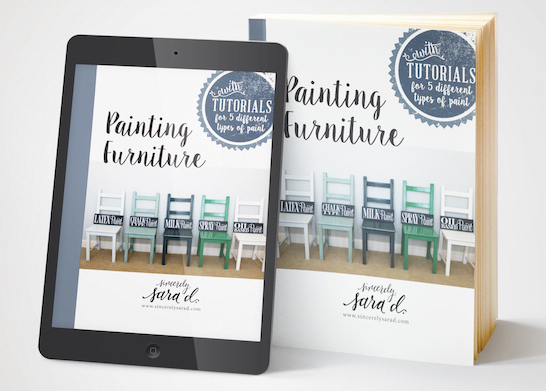 Enter VanGogh chalk paint to the rescue. It turned out great! Kim, I think you and I would be the best of friends! You are definitely my kind of girl. My husband tells people we’re losing square footage in our home because I paint the walls so often. 😉 Thanks for the comment and have a great day! I was reading this open mouthed! So funny I hadn’t ever thought of this! Great idea, I’m totally doing this! Thanks! 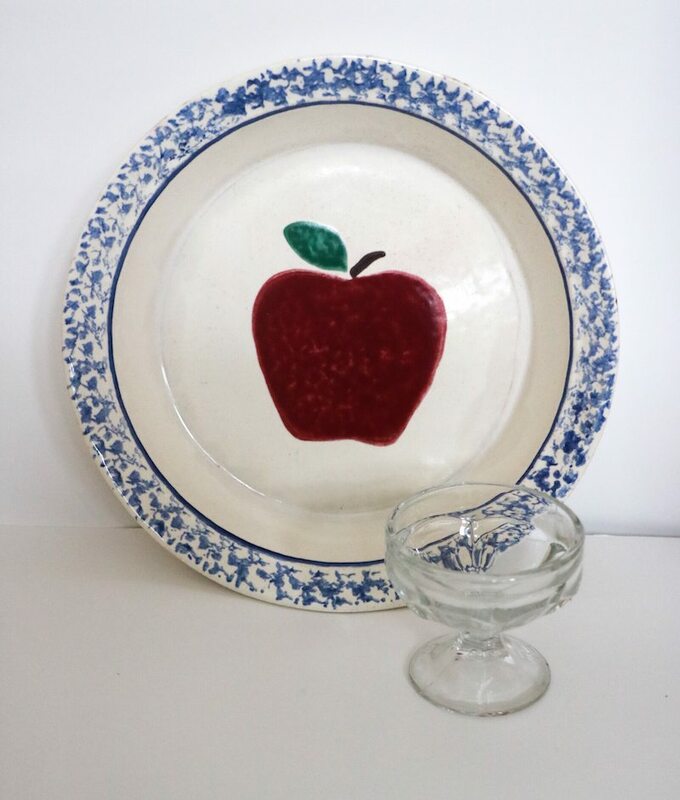 I do lots of thrifting and have sometimes come across pieces of dinnerware that don’t quite look right. Now I wonder if those pieces with the odd finish have been painted, as you show in your blog. You do state that you are not worried that anyone would try to use spray painted pieces to serve food, as you think it would be pretty obvious that it was painted. I don’t agree, as I think that is assuming a lot. Not everyone who shops at thrift shops is as sophisticated in the ways of crafting as you may think. Many people thrift out of economic necessity and have limited knowledge, education or experience. It should worry you that a piece which you, or one of your readers, painted may be toxic to eat from. May I make a suggestion that you use a sharpie to letter a warning on the bottom of each piece you paint? It can be as simple as the ubiquitous “Not For Use With Food”. Give it a quick coat of clear lacquer and it will be permanent. I think it’s important to do this when you paint each piece, even if you plan on only using them at home. Years from now, you may chose to discard them, but wouldn’t remember to make the notation on the bottom. Additionally, most of our belongings tend to find their way into thrift shops eventually. I do not want to be morbid, but if any of us were to pass away suddenly, this is what would happen to most of our things. We have no way of looking into the future or giving direction after we are gone. 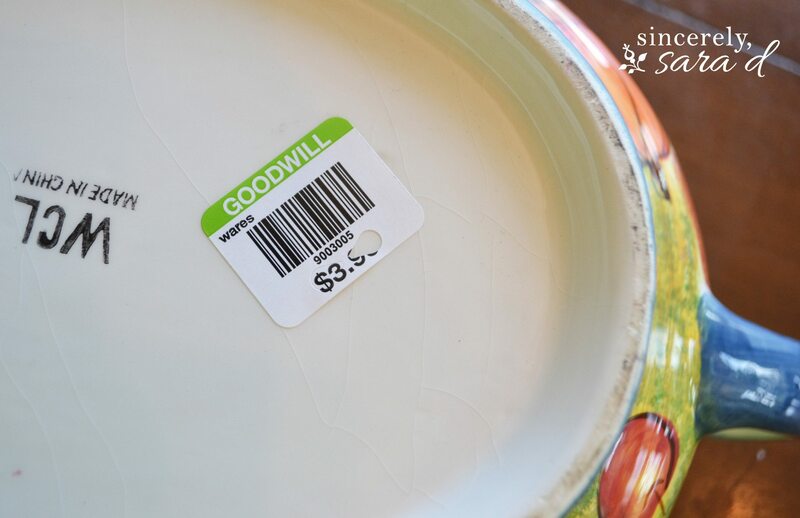 If you envision the piece being donated into the thrift system, you may actually realize that marking your pieces would be the right and honorable thing to do, preventing someone from getting sick one day. It would be ethically responsible of you. 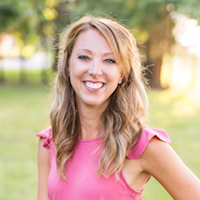 In fact, if you would add this suggestion to the instructional text of your blog post it would help educate those who learn from you to follow suit. Having this hang out in the comments section does little to educate. It actually horrifies me to think that countless crafters could follow your lead and spray paint dishes only to have someone with limited knowledge interpret the finish as glaze drips, not paint drips, and become sick as a result. Thank you for reading and considering this. Hi Loulou, I appreciate all your suggestions! 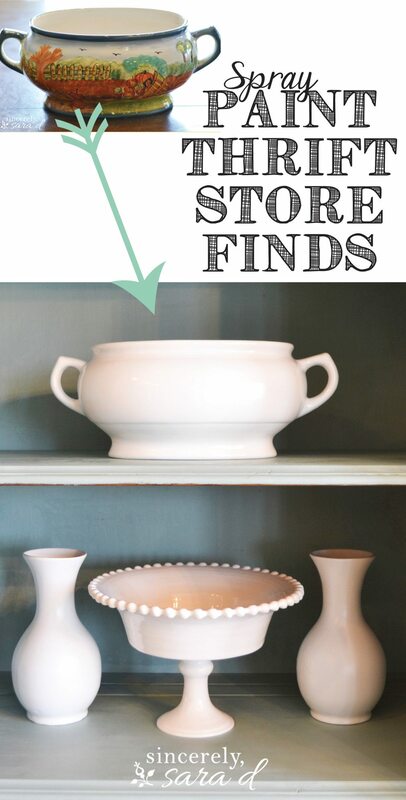 They’re definitely good ones and helpful for when painted dishes do make their way into thrift shops. However, I just wanted to let you know that although spray paint is toxic when wet, it is non-toxic once dry. All paints sold in the US are non-toxic once dry, so I hope that helps calm some of your fears. 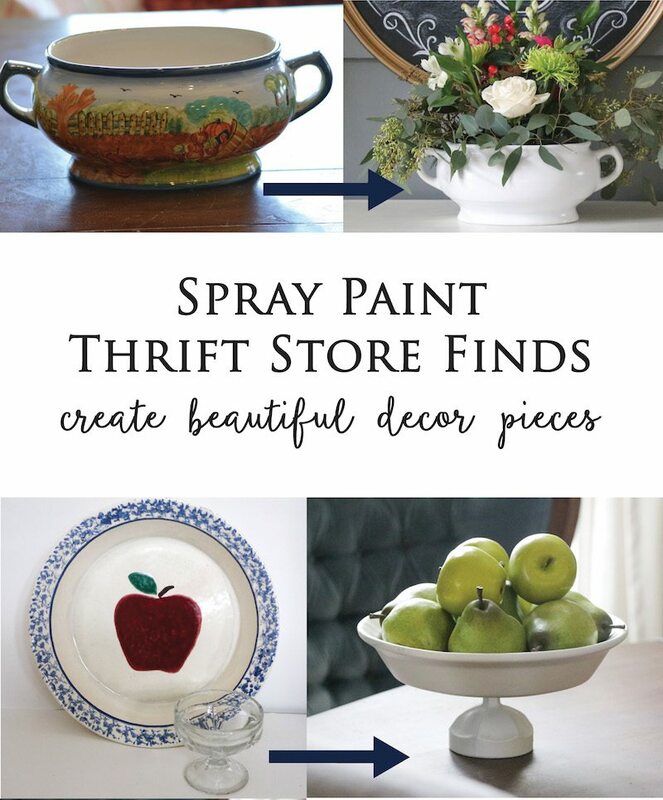 However, I still don’t want people using spray painted dishes for food, and I love your suggestions for how to avoid this! Thank you! I love these! 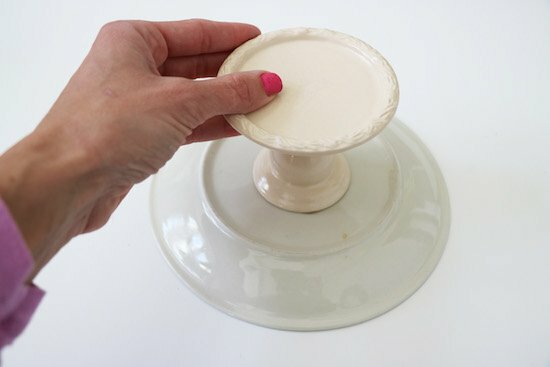 Do you know if this technique safe to do with plates/bowls you will use to eat with? Love your website….can you cook, bake , etc after you have sprayed them??? Unfortunately no – these are just for decor! I just love your idea!! It makes me want to run right out and look for things to paint. thank you so much for sharing this idea!! On another note, I wish some of your readers would’ve taken the time to read through your article and your comments COMPLETELY as many asked the same question repeatedly. At any rate, thank you again and Happy Holidays!! Haha – that happens a lot. Thanks for taking the comment and Happy Holidays to you!